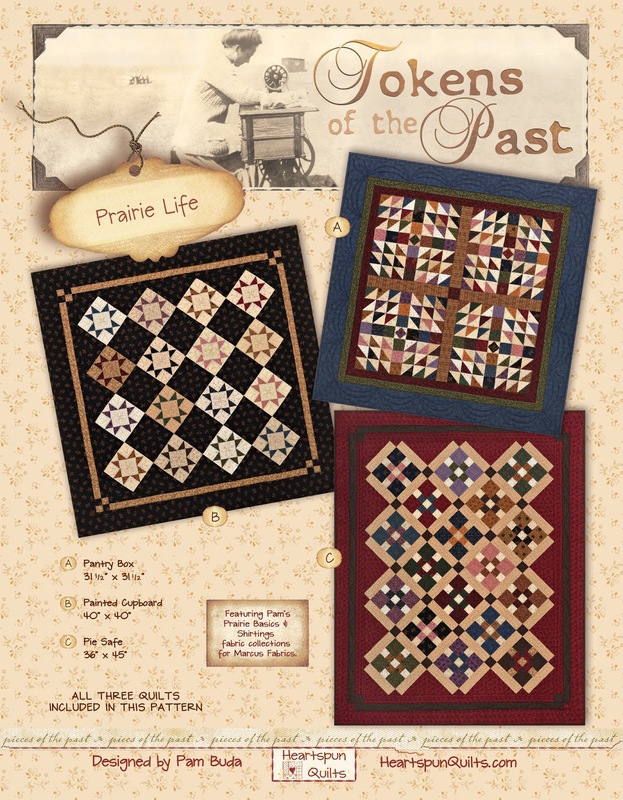 I'm so jazzed to be able to finally show you the three quilts in my newest Tokens of the Past: Prairie Life pattern. Yes...you will make all the blocks for all three quilts from just one 10 x 10 precut of my newest fabric collections, Pam's Prairie Basics & Shirtings. 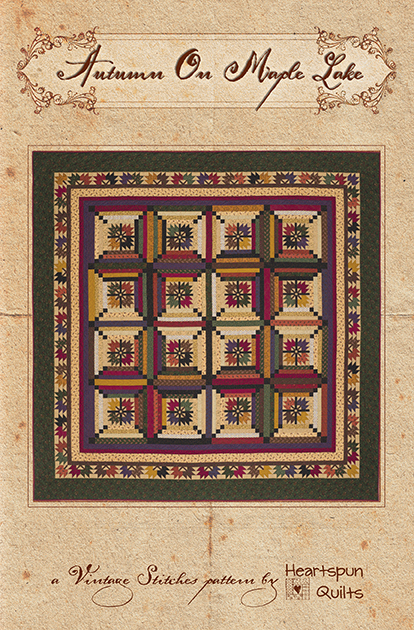 The Prairie Life pattern includes instructions for all three quilts, and has instructions to make each quilt separately as well. 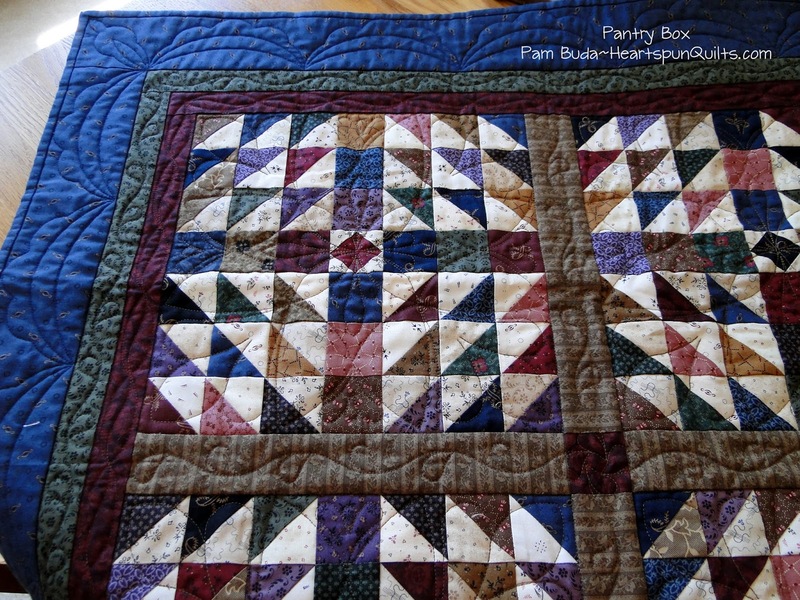 First up is Pantry Box, which measures 31.5" x 31.5". It's easy to piece and very graphic which I love. 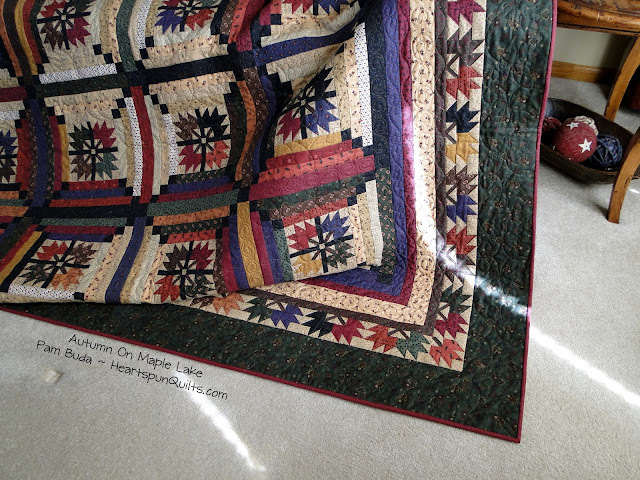 Red, blue and green are my core colors and this quilt can live anywhere in my home. I really liked it over the old ironing board. Once again, my friend Ronda worked her magic with her quilting talents. For each quilt, I just had to try to highlight the quilting. It adds so very much to any quilt. 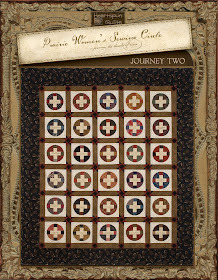 Next is a quilt called Painted Cupboard which measures 40" x 40". 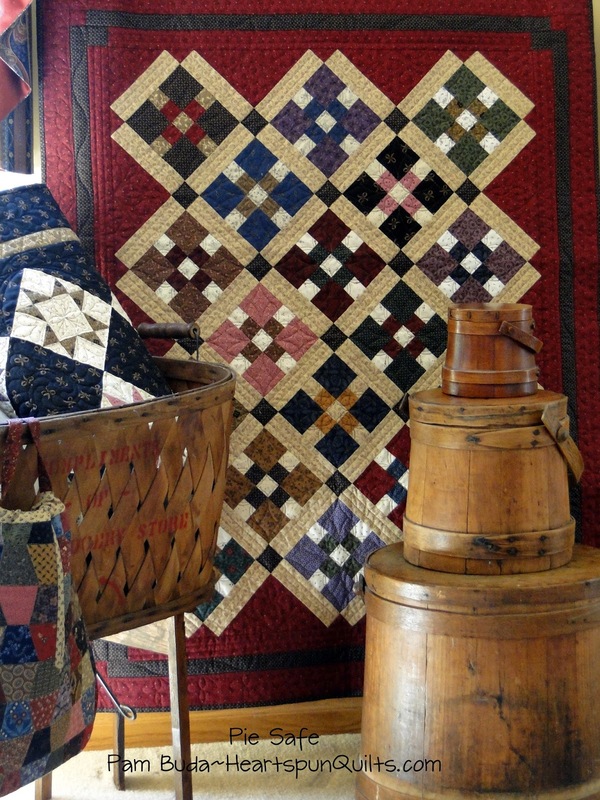 There's something so classic and wonderful about adding black to a room, and quilts are no exception. 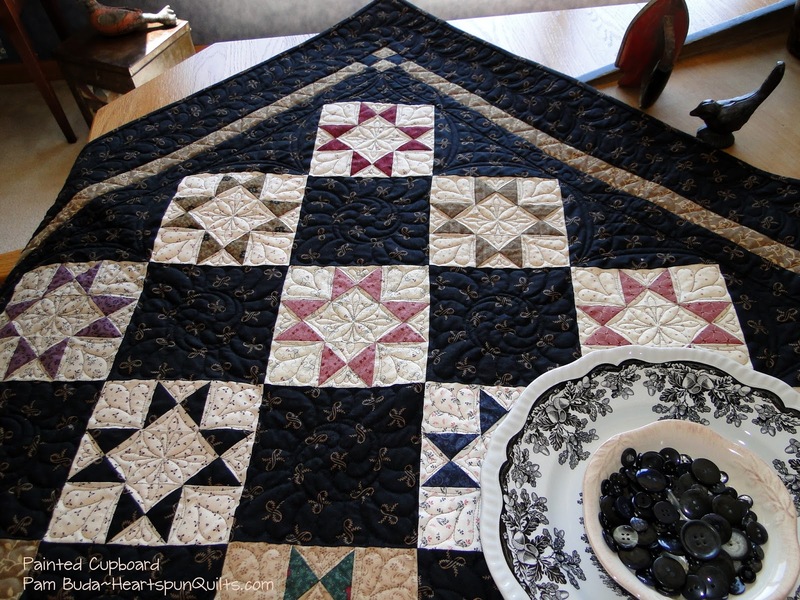 Black goes with everything and sure made these Ohio Star blocks shine a little brighter. Last, but not least, is Pie Safe which measures 36" x 45". A simple block with traditional appeal, I thoroughly enjoyed pairing different fabric combos for each block. 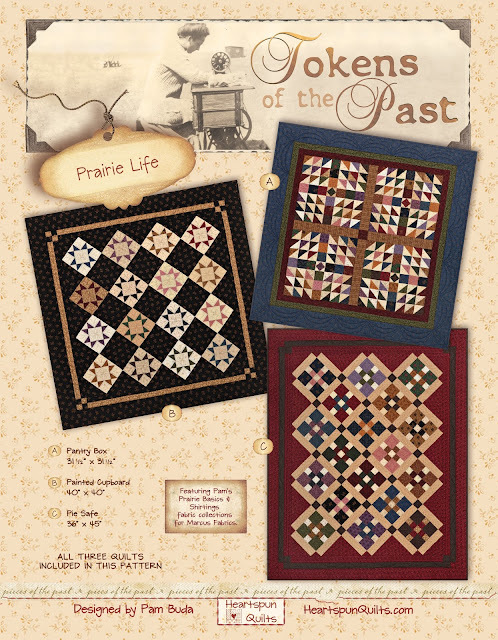 You will find the Tokens of the Past: Prairie Life pattern here. 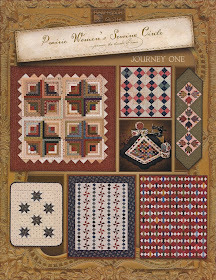 You can also order the Tokens: Prairie Life complete kit, and for a limited time, you will receive the pattern FREE! Click here to order the complete kit with all the same fabrics I used for all three quilts. 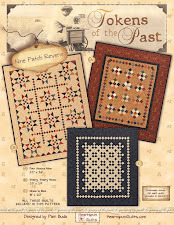 Also available are the Pam's Prairie Basics & Shirtings 10 x 10 precuts. 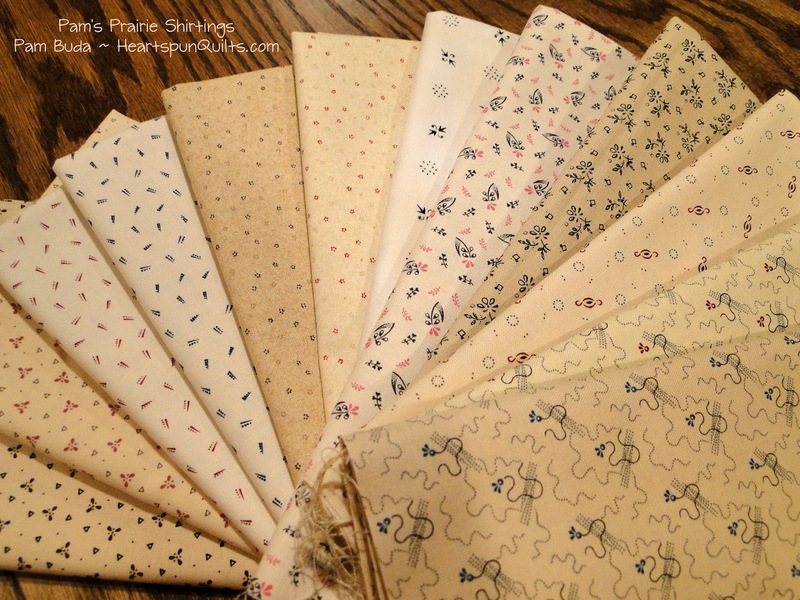 I know many of you have written me to say that you love the 10 x 10 precuts for all your scrappy quilting needs as Fat Quarter bundles are a little too much fabric for your scrappy quilts. You'll find my 10 x 10 precut bundles here. The pre-spring quilt market madness goes on in the flurry to complete the last two quilts. 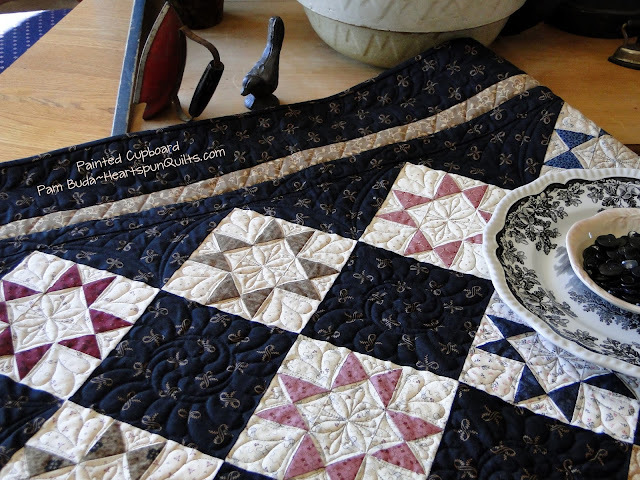 Cottonwood Creek is almost done and the new version of Peacefield is headed to my quilter, Ronda. 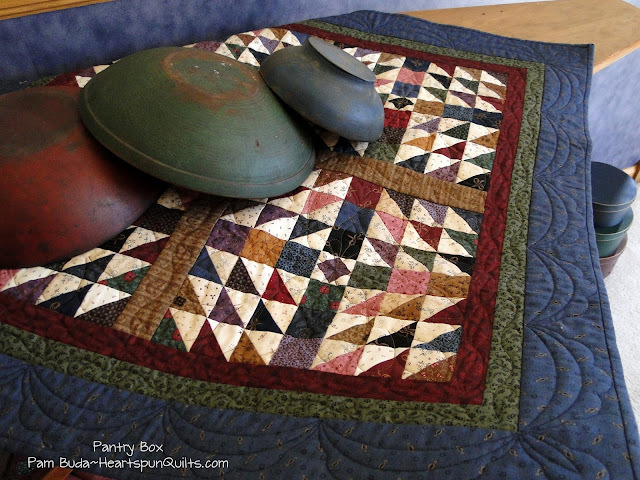 New color bank bundles are also being created as is a new Limited Edition quilt offering....all coming soon. Well....as soon as I finished piecing Cottonwood Creek! Check out my Instagram and Facebook posts for more sneak peeks as well as my next blog post. Until then....reward yourself with some time with needle and thread. 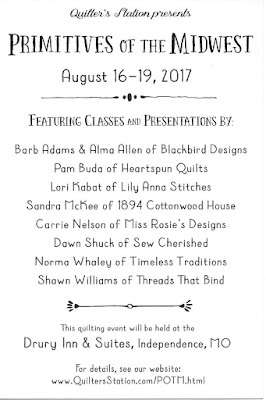 Pam's Prairie Basics & Shirtings Debut! Introducing Cottonwood Creek, the quilt that helped inspire my brand new Pam's Prairie Basics & Shirtings collections, created just for Marcus Fabrics, of course! Last year, while traveling through Maine and Vermont, I toured the Shelburne Living History Museum. I could have stayed there all week! I was truly smitten with the Tuckaway General Store because it is an experience in walking back into nineteenth century as it really was. By the time I visited Shelburne, I was already busy planning the Basics and Shirtings line in my mind, and being there was a buffet of creative food for thought. As I stood taking in all the sights, sounds, goods in the shop, with the creaking floor beneath me, I imagined myself a Prairie woman coming in to shop for needful things. Nothing fancy, just the "basics" of life on the prairie. Shirtings were a lovely basic of life then, and I adore them now. They are lights that give a quilt so much interest. Muslin was certainly a big staple then, and there are many, many lovely quilts made with muslin, but somehow, I just like shirtings so much more than plain muslin. 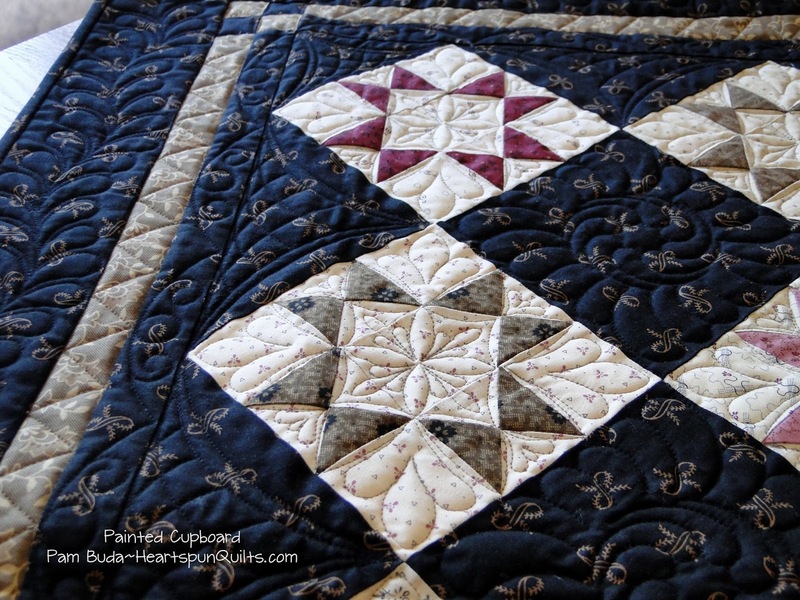 In my Cottonwood Creek quilt above, Barely There is used in the center of the quilt, surrounding the center star and pinwheels. 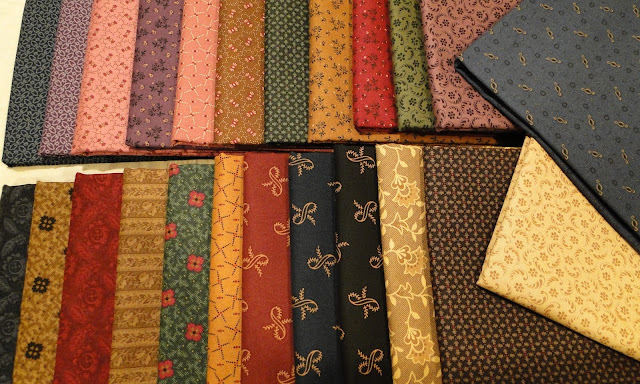 There are 12 new shirtings in the collection. 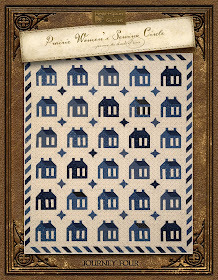 The "basics" portion of Pam's Prairie Basics have 24 new prints. One of the best things about a Marcus Fabrics Basics line is that the fabrics, both the shirtings and the darks, will be available for an extended period of time....about 2 years. Each print was chosen with purpose in mind. I wanted a range of our favorite Civil War repro colors....reds, blues, greens, plums, brown, blacks, tan, deep golds and dusty pinks. 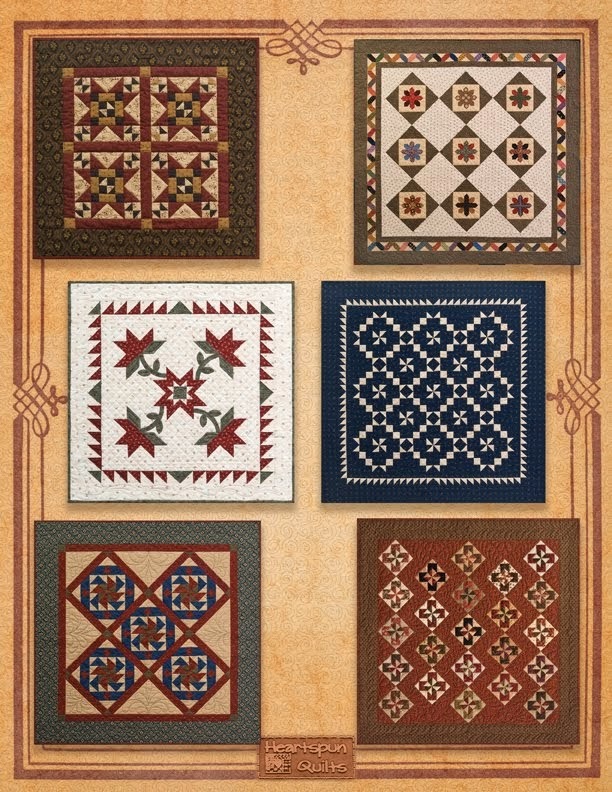 There also had to be prints suitable for borders for a larger quilt, borders for smaller quilt, and a rich print in tone on tone. Add some geometrics, little country florals, and we have a beautiful mix of basics! 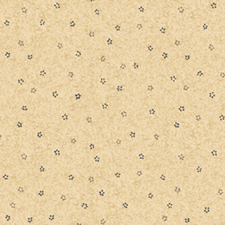 We all need to have a really good beige tone on tone to work with in our quilts, and so that was another print that just had to be in the line. Something that gave a little bit of motion without being overwhelming. This print is called Butter Press and comes in two other colors. It is used in the star pieced border in Cottonwood Creek. All of the prints in the collection are named for items of everyday living...the basics of living, if you will. 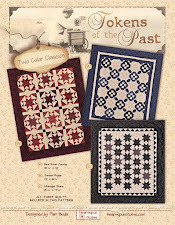 The next two prints I chose because I have long wished to use them in quilts, and they are just not always available. I figured you might be looking for them as well, and with the extended availability, we would finally have them for awhile. 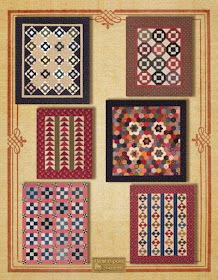 The stripe print at the right, called Apron Strings, is a print I love using in sashing and borders. I chose a neutral tan color because it works with just about anything, and sets itself apart nicely from the background color of blocks without overwhelming the quilt. It came from one of my oldest antique quilts and is a traditional classic. Honestly, it looks great in a block, too! The print at the right, called Lace, is one of the prints I am most anxious to use. It is a print that is nearly impossible to find and not often printed. 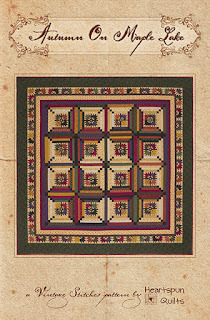 Used in the center of my Cottonwood Creek quilt above, it surrounds the Nine Patch blocks and gives shading and interest to the quilt center. 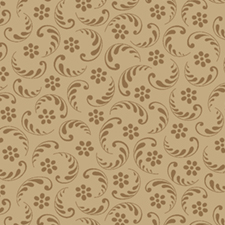 Printed in tones of beige, tan and browns, it goes with everything Civil War and looks stunning next to the darker colors. 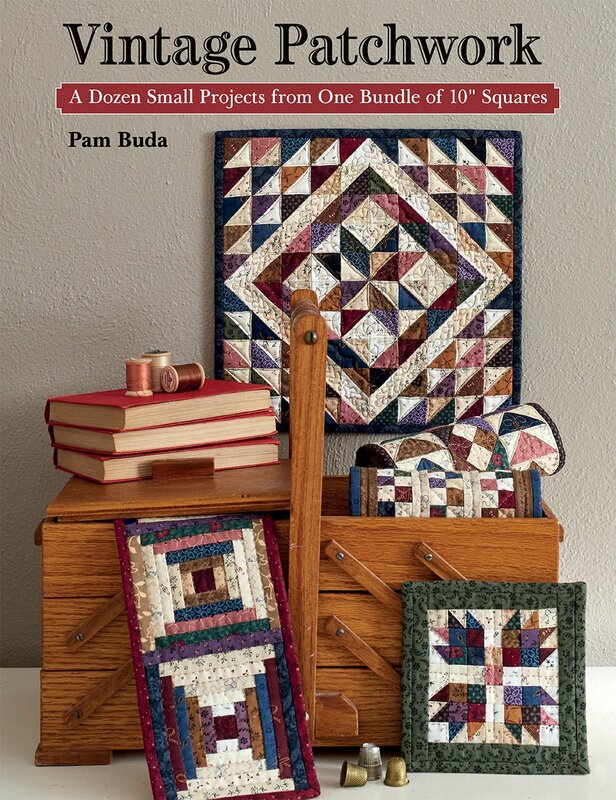 Pam's Prairie Basics & Shirtings is in your Local Quilt Shop now!! Please shop your LQS and ask for my fabrics there. I would like it to be your first stop in shopping. If your LQS doesn't carry my fabric collections, you can order them from my website. 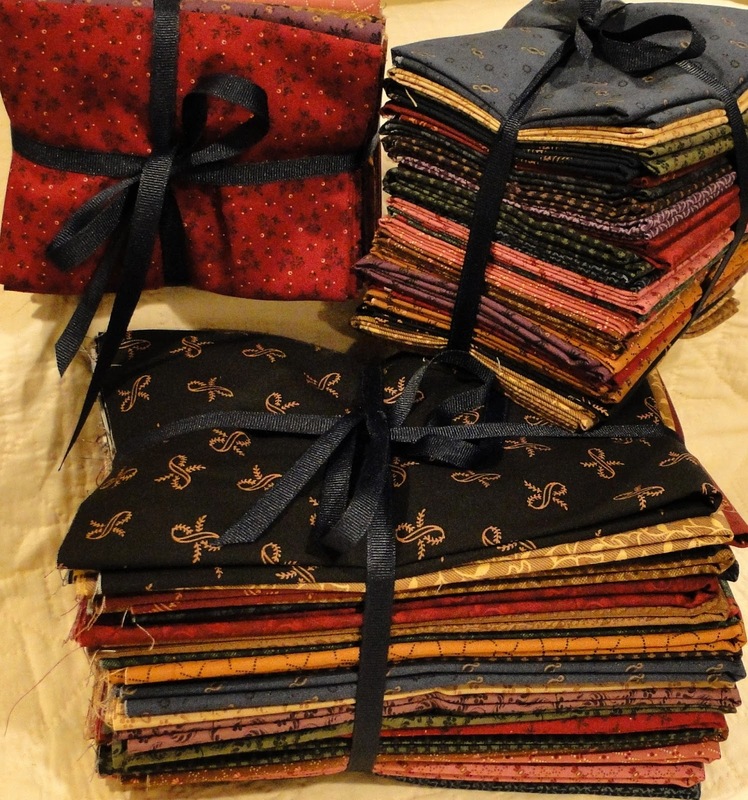 I have prepared both Half Yard bundles and Fat Quarter bundles of all 12 shirting prints. 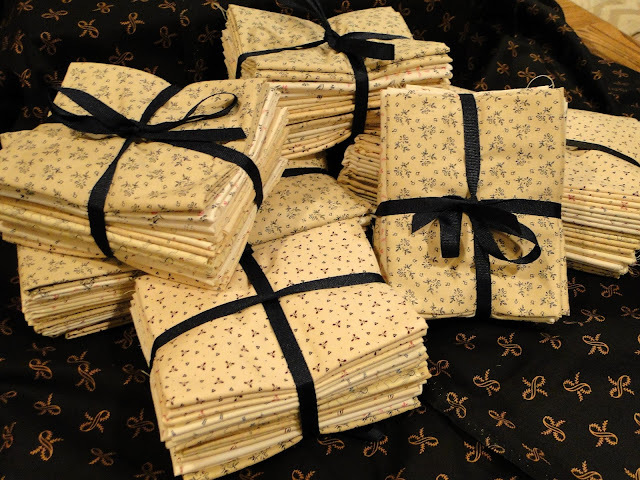 Half Yard bundles and Fat Quarter bundles are also available of the Basics collection! Click here to order......and guess what? For a limited time only....Pam's Prairie Basics & Shirtings are 15% off! 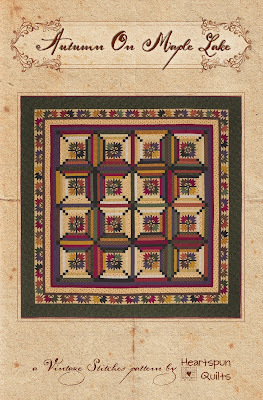 I'll be sharing all kinds of goodies on my new Tokens pattern called Tokens of the Past: Prairie Life....all using a 10 x 10 and yardage of the Basics & Shirtings collection. 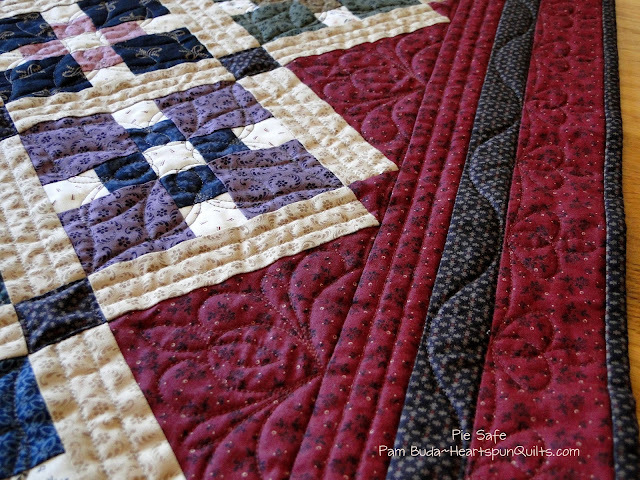 Photos of the three quilts coming soon! 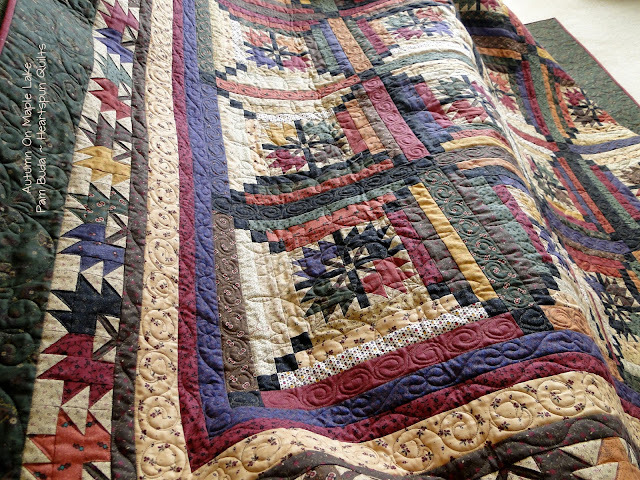 Isn't it so, so satisfying when your quilt is finally complete, quilted and bound, and you can begin to enjoy it by display, or cuddling underneath all that yummy fabric?! 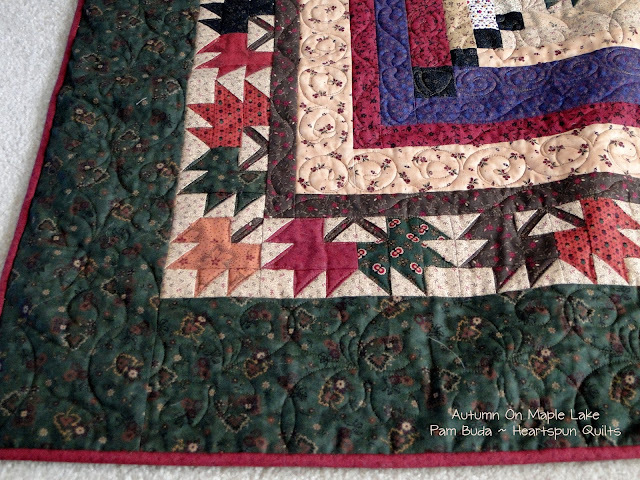 All three of the Tokens of the Past: Autumn Sampler quilts are now finished and I enjoyed binding them. 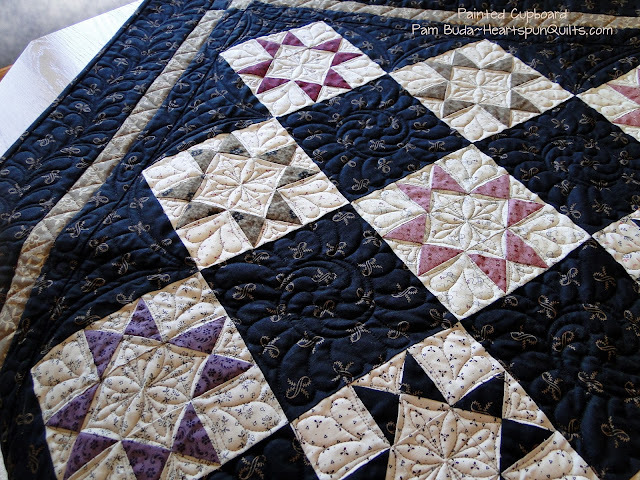 My friend, Ronda, once again outdid herself with the quilting we chose. I can't choose a favorite. Glad I don't have to! 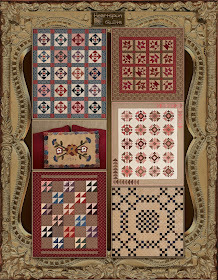 By now, you know that all of these quilts are made from my new fall collection called On Maple Lake, (for Marcus Fabrics) which is in your LQS right now. 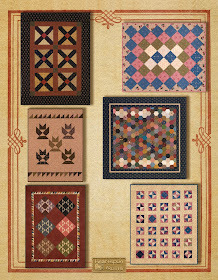 The three Tokens: Autumn Sampler quilts are all made from just one 10 x 10 precut of the collection, plus additional yardage for sashing, borders and binding. 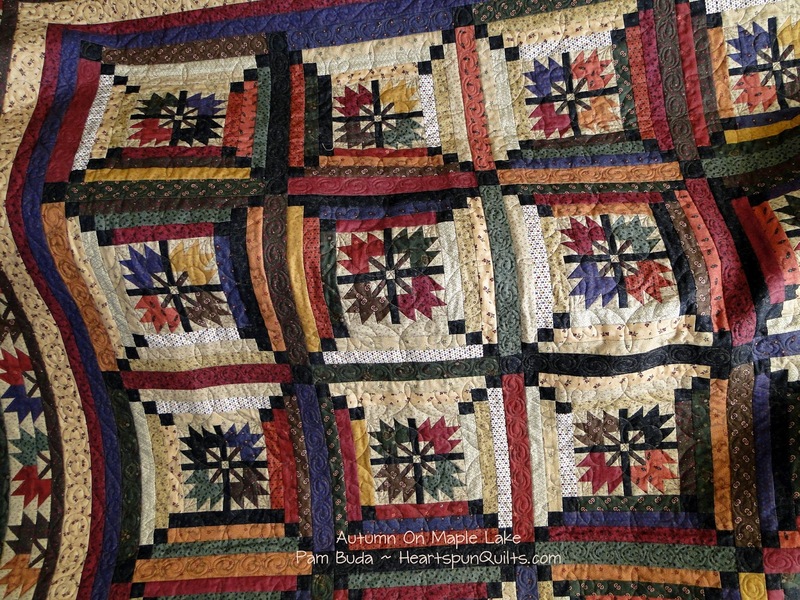 All three quilts are included in the pattern, too. The 10 x 10's of On Maple Lake have not been delivered just yet, but are expected this month. 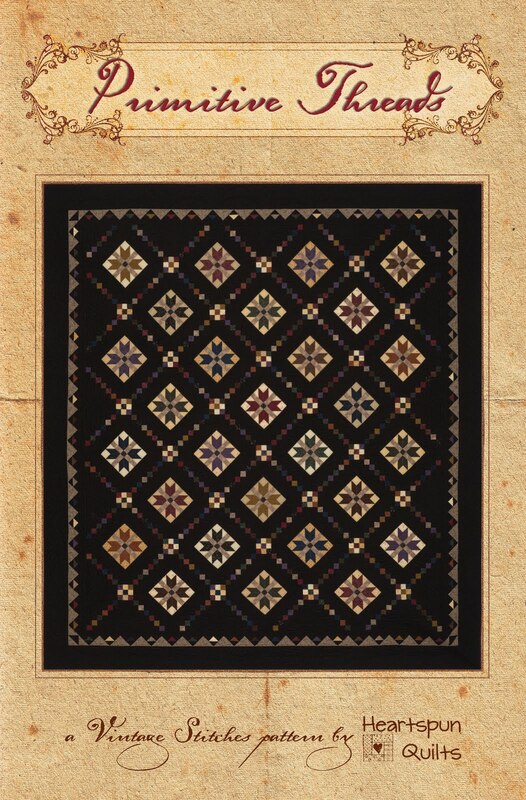 You can order a kit for all of the Tokens: Autumn Sampler quilts here. The pattern is also sold separately here. 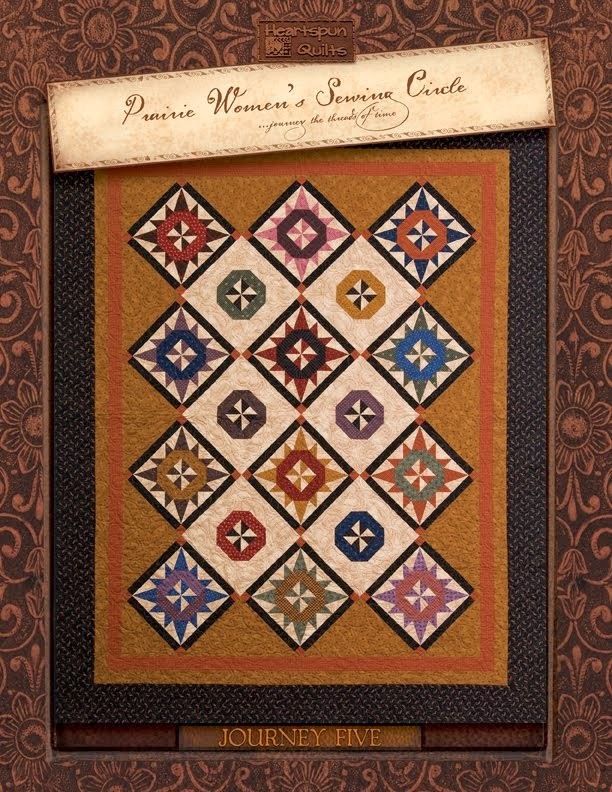 I'll be posting photos of my new Pam's Prairie Basics fabrics, along with a sneak peek at the Tokens quilts made with the both the Basics and Shirtings, as well as the feature quilt which is presently in production. I'm Teaching at Primitives Of The Midwest! My thanks to everyone for your comments. It was very fun and interesting to read about favorite events held at your local shops. Some are very inventive and creative and you can certainly see why they're a favorite. 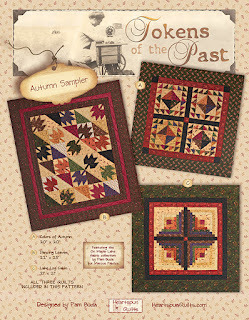 Five random comments were chosen to receive a complimentary Autumn On Maple Lake patterns. Robin.......My favorite LQS has a once monthly sit and sew. It is open to all, just bring a project you want to work on or if you are having a problem with a block or a section in a class the owners are more than happy to assist. The best part about this lovely shop is it is within walking distance of my home! Linda......Fantastic colors and perfect pattern! My LQS hosts a BOM where for a minimal investment we receive 2 "starter" fabrics (this year is 10" x 12") and a pattern for a quilt block. We watch the demo and go home to add our own fabrics to make a 12" block. 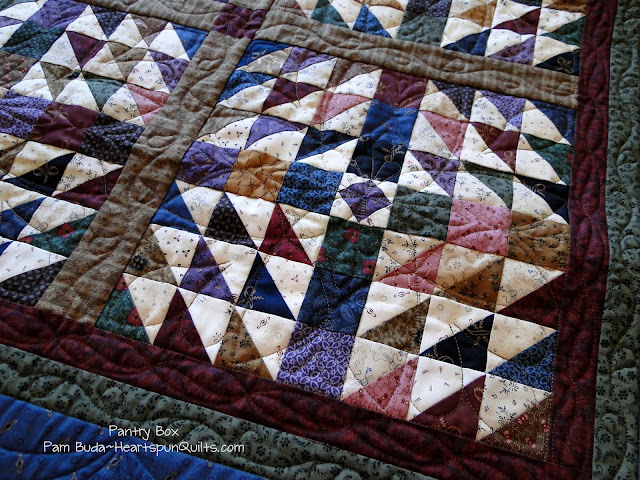 Everyone's quilt is different as the only requirements are that each of the starter fabrics must be in the block and that there are as many pieces in the block as the pattern has - no cutting a 3" square if the pattern calls for HST! It is a great learning experience as we increase our skills over the year with progressively more challenging patterns as well as learn about color, value and texture while creating unique blocks. 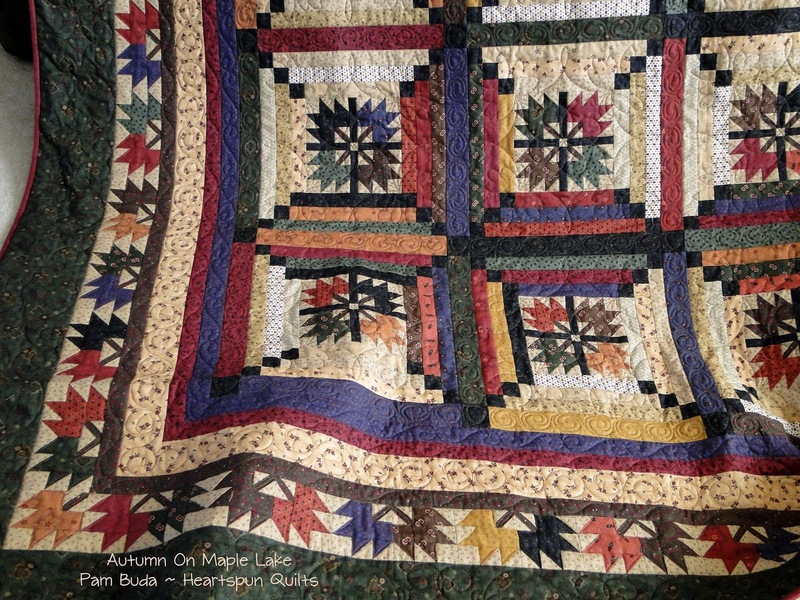 Esther....Fall is my most favorite season and your quilt is absolutely gorgeous. Would love the pattern and fabric! I am very fortunate to have my LQS just a few miles from my home. The owners are great ladies and always coming up with fun things to do. To name just a few: once a month we have sample (block) club and today I'm going to "Sit & Stitch". They make the coffee/tea and we sit, stitching away and chatting, too! 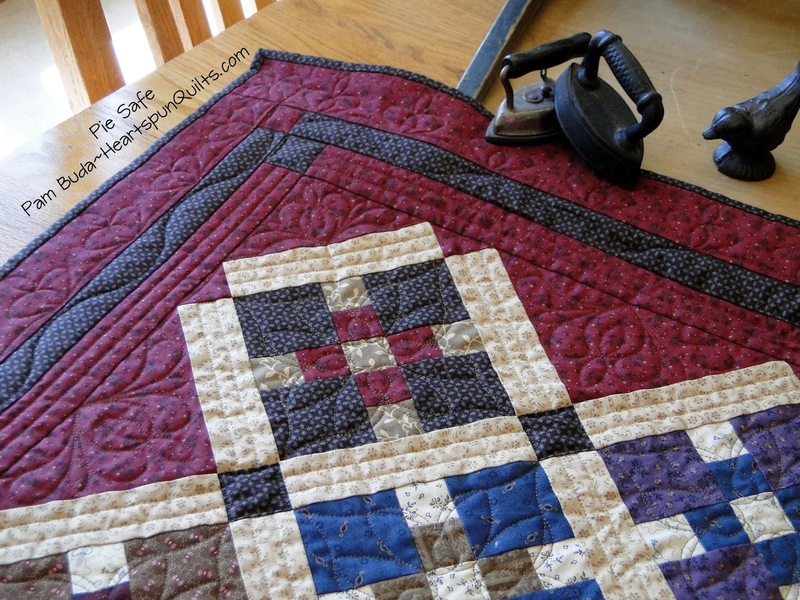 Great fun with a wonderful bunch of quilting buddies. 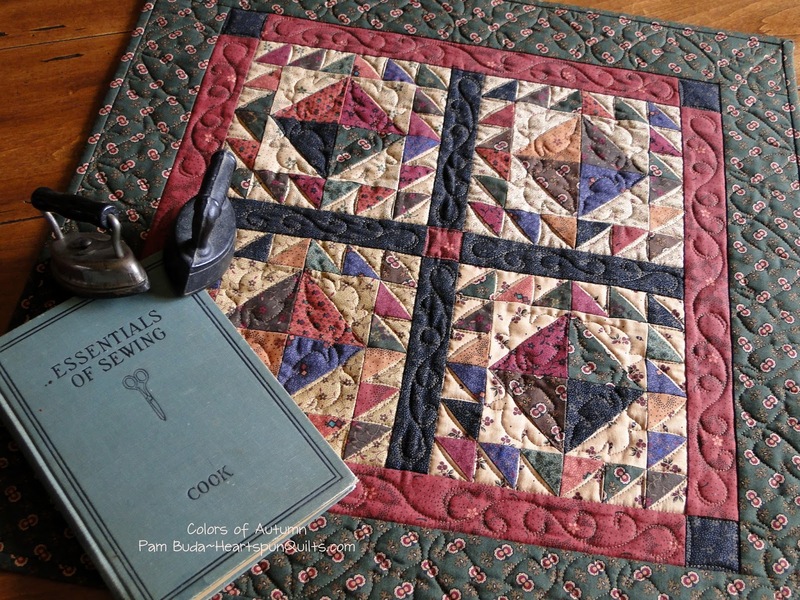 Thank you, Pam, for all you do and share in the quilting world! 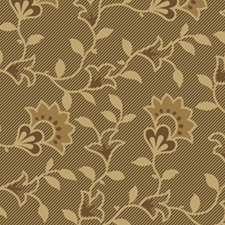 Bonnie....beautiful pattern and fabrics, Pam. being Canadian, I am partial to Maple Leaves. 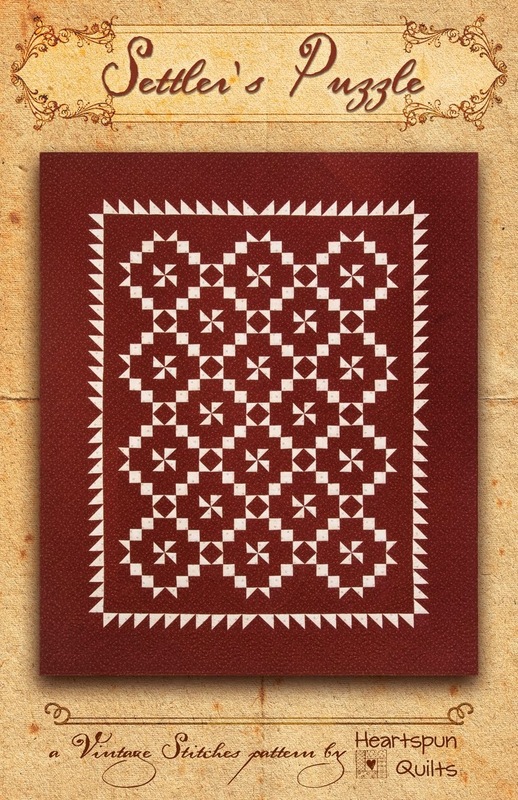 I would love to win a copy of this pattern. Thanks for sharing. 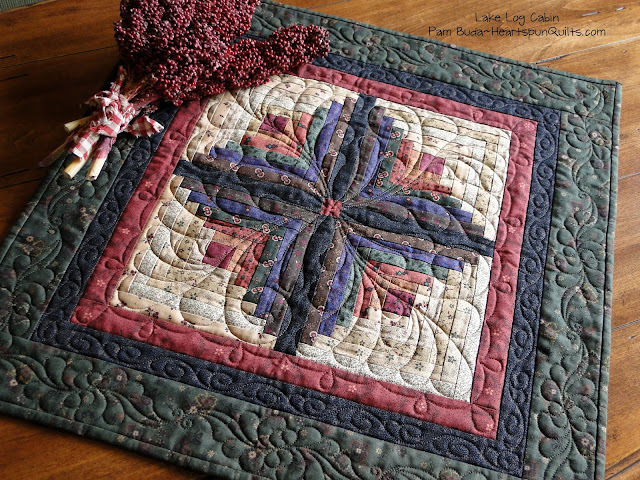 Gloria....Such a beautiful quilt! Thanks for the giveaway! 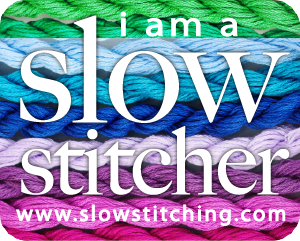 Loving Stitches, my LQS, is fantastic! This past year their tech/repairman held a class on machine maintenance and troubleshooting. I am so glad I took advantage of it. Invaluable! 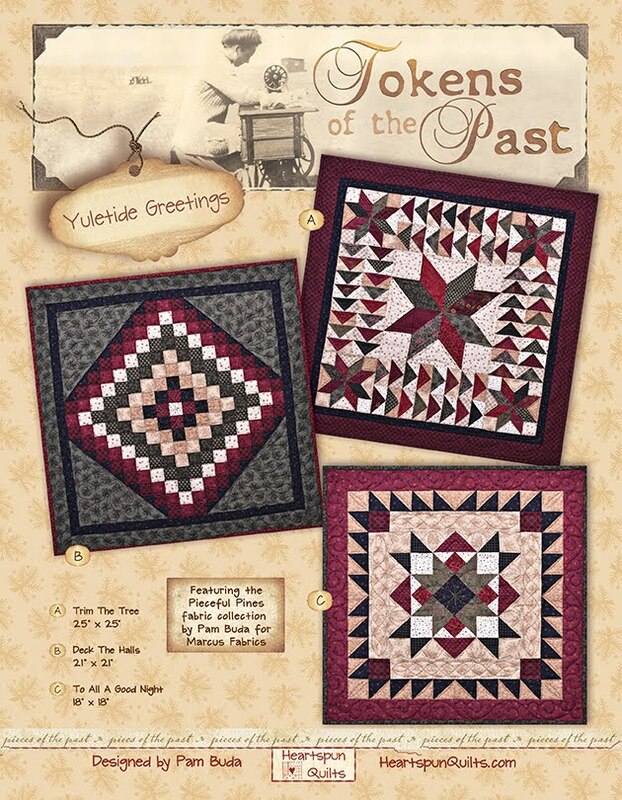 Please email your mailing address to me at Pam@HeartspunQuilts.com and I'll have your pattern in the mail for you! 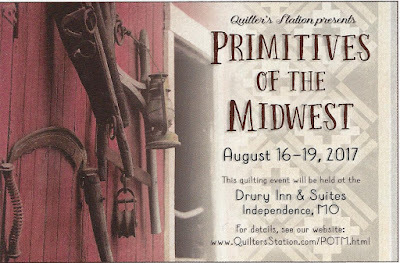 I am SO, SO JAZZED to announce that, once again, Quilter's Station in Lee's Summit, MO is hosting their Primitives of the Midwest event! Yahoo!!! in all of your favorite primitive mediums. 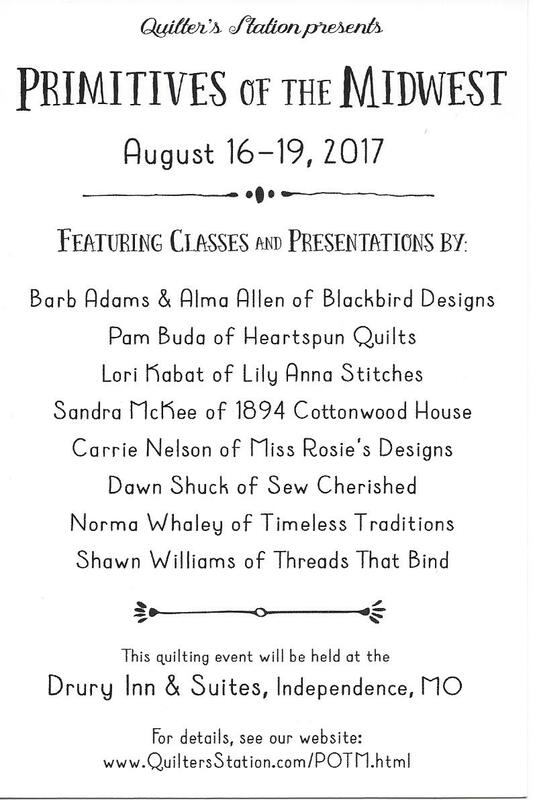 Quilting, applique, punch needle, wool...you name it! Click here to see more about the teachers and their classes. If you have never had the chance to visit Quilter's Station, you're missing something!! It is one of the premier shops in the US and is in my list of favorites for sure! Shop owner Rita Briner, and all the shop girls do an amazing job in display to inspire you, and have an inventory to die for! All I can say is start saving your pennies now! 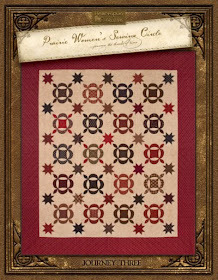 I will be teaching two brand new small quilt projects using my new Pam's Prairie Basics & Shirtings line! 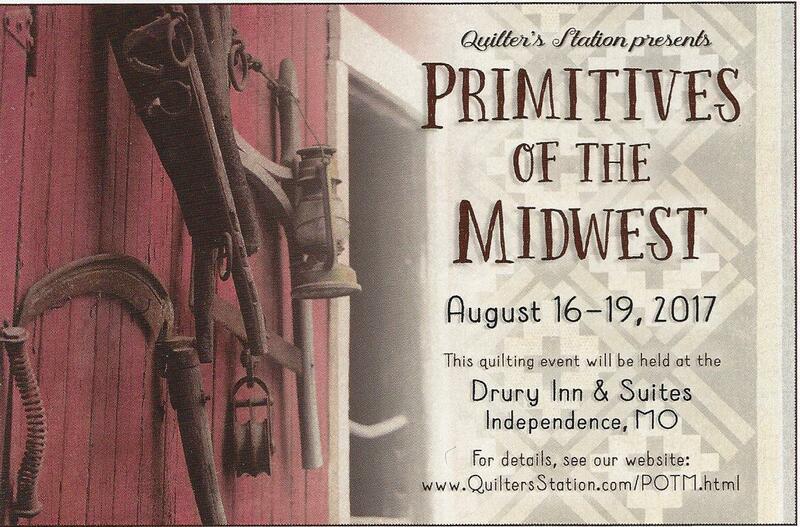 I'm so excited to return to Quilter's Station and Primitives of the Midwest! August won't come soon enough. Click here if you'd like to see my blog post from the last time I taught at POTM. Sure hope you'll join us! Autumn On Maple Lake Is Here! It's always so exciting when all the work has been done and I can finally release a new pattern. My new pattern, Autumn On Maple Lake, using all the fabrics in the On Maple Lake (for Marcus Fabrics of course!) collection, is quilted and bound! 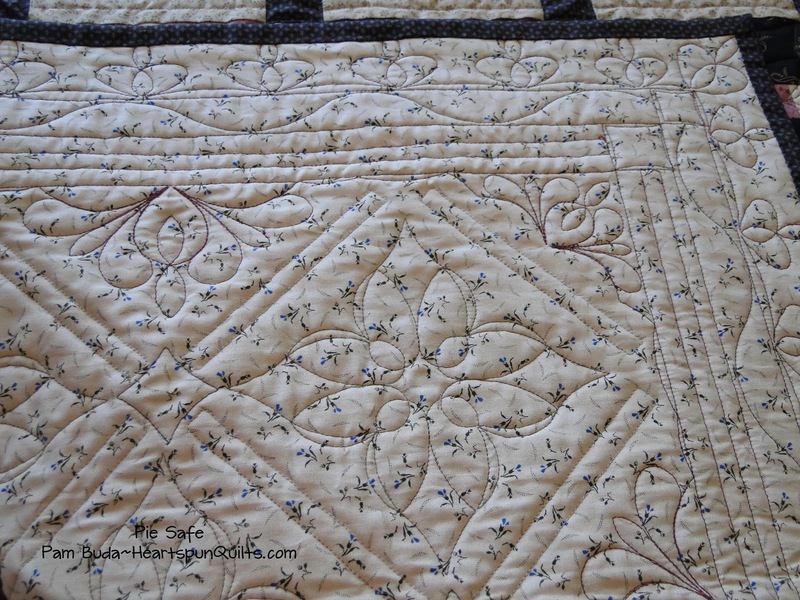 My dear friend, and quilter extraordinaire, Ronda quilted my quilt. LOVE! 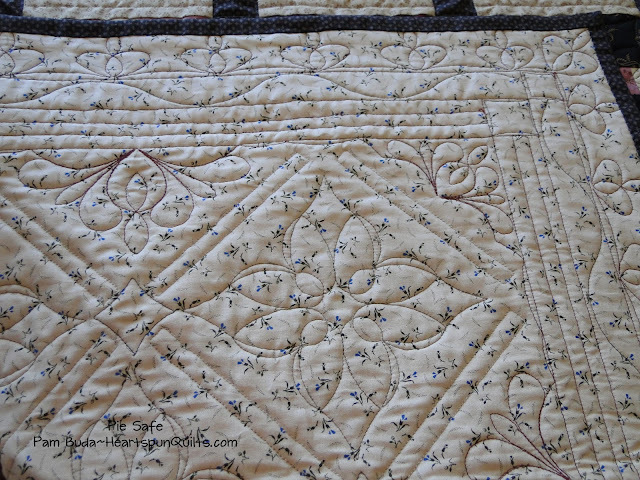 Another dear friend, Debbie, pieced the quilt for me. She does just a fantastic job and I could not be happier...nor could I possibly keep up with all of this myself. You know me and photography....I usually can't take a photo capturing the real colors of the quilt, but I think these pictures do a pretty good job. I wanted this quilt to be a burst of fall color and I am so happy with the way it all turned out. I simply adore the main print in this collection. 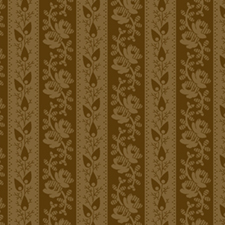 I wanted it to be subtle, and have some of the fall colors in it, but also a print that could be used in a quilt that wasn't fall at all. I think I succeeded. I also thought you'd get a kick out of what the original antique print looks like. Maple Lake is a real place near my home. It's man made, nestled within a huge Forest Preserve area. There's a woody trail to walk that surrounds the lake. For many years when I was a kid, and when the leaves were falling, and in plentiful supply on the ground, my entire family...including aunts, uncles, cousins and grandma's would go there for a picnic. All of us kids would roll around in all the leaves and play, eat great food, and everyone would take that leafy walk around Maple Lake before packing up to go home. The tall trees were just filled with magnificent colors, the air clean and crisp, making for memories to last a lifetime. 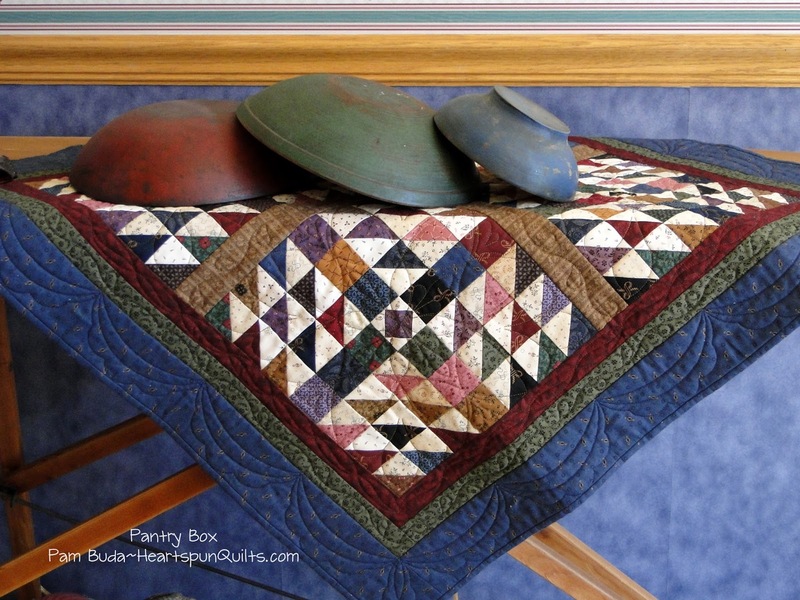 It was my inspiration for this collection and for the four quilts I designed to go with it. It's funny to be talking about fall when spring is well on its way....but in the world of fabric, the seasons have their own timeline. 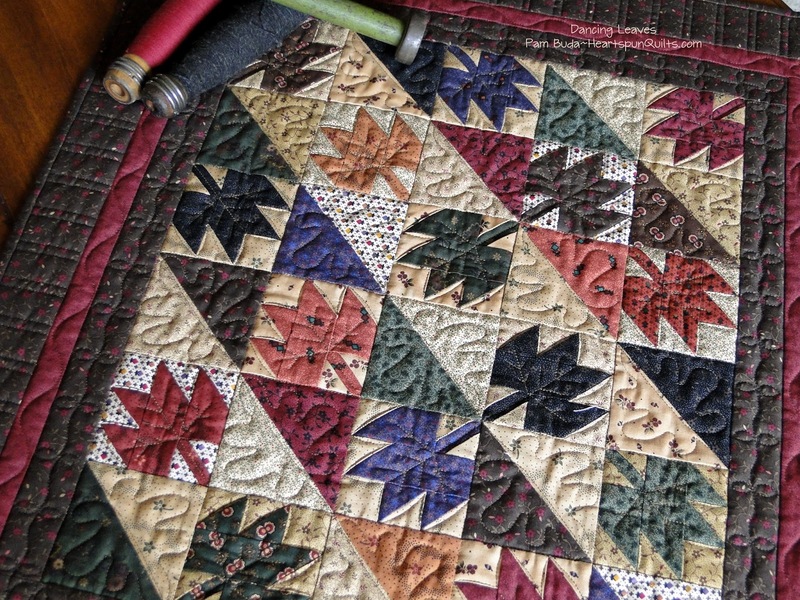 Lucky for us, too, because if we start working on these fall quilts now, they will be ready in time for those new leaves just now budding, to fall once again. The On Maple Lake fabric collection is being delivered to your LQS right now.....so go shopping to see all the fabrics in person! Many shops have ordered the pattern, too, so you can buy the fabrics & the pattern to make your very own Autumn On Maple Lake quilt. If your LQS doesn't carry the pattern, you can order it here...but, please DO support your LQS! Click here to order the Autumn On Maple Lake pattern. 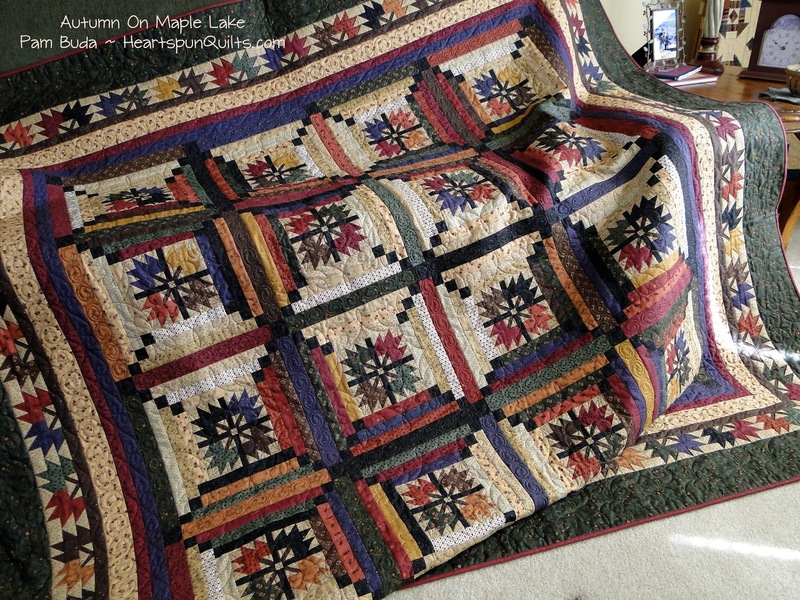 I happen to have extra Autumn On Maple Lake patterns here (teehee) and would love to give away a few of them! 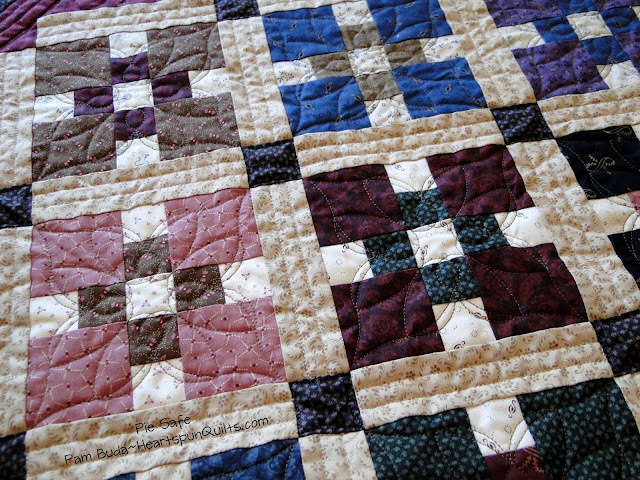 So.....leave a comment on my blog telling me about a favorite event you have attended at your local quilt shop. I'll choose a few winners on Tuesday. I'm sorry, but...to be fair to everyone, I cannot accept email entries. 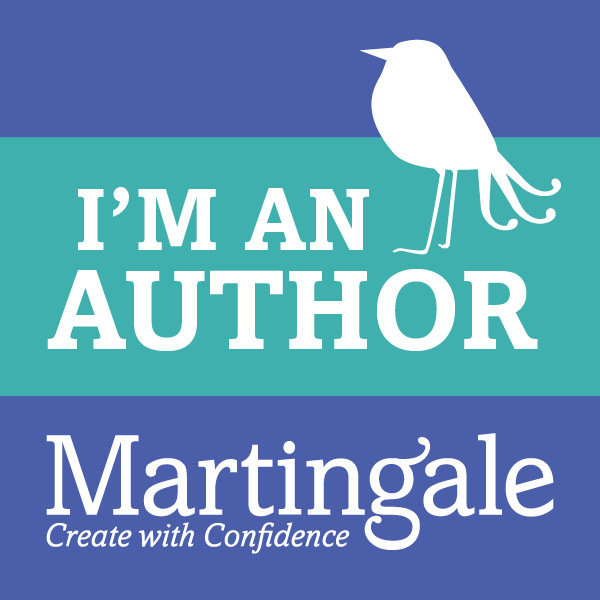 International readers are more than welcome to leave a comment! Can't wait to hear from you!